Pamela Mann are bringing you THE latest Metallica merchandise. 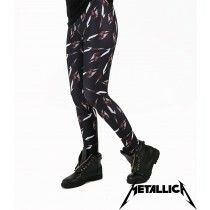 These high quality leggings are perfect for metal lovers who want to show off their love for their favourite band! Officially licensed by Probity Europe. PLEASE NOTE THAT LEGGINGS THAT ARE LICENSED HAVE A MINIMUM ORDER QUANTITY OF 12.